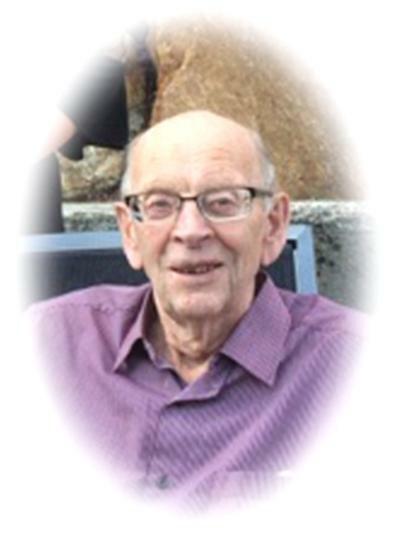 Ian McKinnon Budding, late of Weyburn, SK passed away March 16, 2019 at the age of 89 years. Ian was predeceased by his parents: Thomas and Isabella Budding; his sister Elsie Weisbrod. Ian is survived by his wife of 65 years, Leona; his son, Dave (Joan) Budding; daughter, Sharon (Bob) Janzen; daughter, Daphne (Thomas) Bishop; son Dale (Lori-Ann) Budding; grandchildren: Stephanie Bracken, Becky (Jason) Tiede, Michelle (Patrick) Sinclair, Christy (Steve) Ewert, Aaron (Erin) Janzen, Heidi (Steve) Magill, Ashley (Nick) Benoit, Dallas Bishop and Mandy Bishop; 18 great-grandchildren; as well as special niece Iona Reinheimer; nephews, cousins and in-laws. A Funeral Service was held Friday, March 22, 2019 at 2:00 p.m. at Weyburn Free Methodist Church, 133 ~ 14th Street NE, Weyburn, SK with Pastor Jody Pfeifer and Pastor Ian Isaak officiating. Active Pallbearers were: Aaron Janzen, Patrick Sinclair, Steve Ewert, Steve Magill, Nick Benoit and Dallas Bishop. Interment was held at Green Acres Memorial Gardens, Weyburn, SK with luncheon following at Weyburn Free Methodist Church Hall, 133 ~ 14th Street, Weyburn, SK. For family and friends so wishing, charitable donations in memory Ian may be made to Gideons International In Canada, P.O. Box 3619, Guelph, ON, N1H 7A2.